What a lovely day to be outside drinking cider in Seattle! Luckily we had some cloud cover and it cooled off from the high 80s we’ve had of late to the low 70s. Although this was obviously a beer event, they had 10 cider choices out of the approximately 200 selections. This was a three day event and we thankfully had the foresight to get there not too long after they opened at noon on the first day (Friday). Yay for an excuse to take off work! As the day went on it got only more crowded, and I can only expect the same for the rest of the weekend. 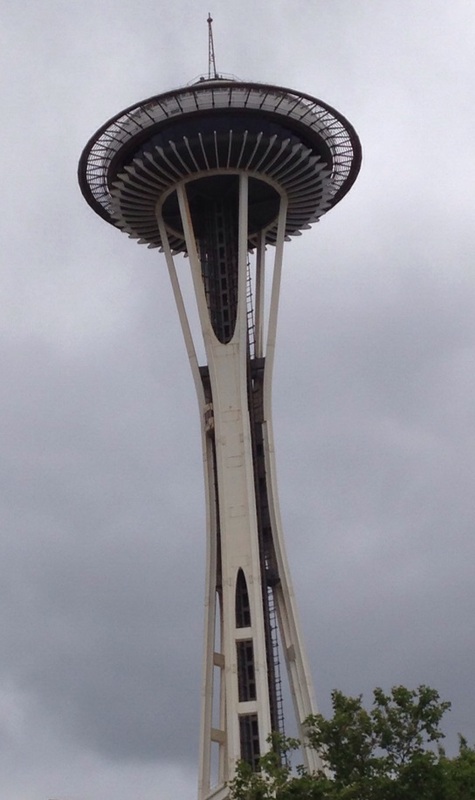 Fisher Plaza in Seattle Center near the International Fountain was a great venue choice. The event was mostly outside on the lawn, but there was also an inside portion. Inside even had real restrooms (although there were also port a potties outside). Sadly they did not allow outside beverages, even sealed bottles of water, so we dumped them and eventually found the water bottle fill station by the restrooms (otherwise it was $1 or $2 from a food vendor). They housed the bottled selections inside and all the taps outside. Most taps were coolers with two taps per cooler. There was some seating & shade thankfully, so the blanket I brought wasn’t necessary (although it would be when they were busy). There were numbered Tables with four selections per Table, and the event program listed all the beer/cider details and location. This was very very well organized, especially compared to many tasting events I’ve been to. I imagine Saturday afternoon here will be a zoo though! This is a dog friendly event and we saw many many dogs. They even had water bowls out for them, which I’m sure was appreciated. There were also games to check out, which appeared to also be appreciated. We saw lots of people just hanging out listening to the live music. Others were more obviously beer aficionados. There was even a smoking tent which kept the smell contained, although the cigar area at the top of the hill allowed cigar smoke to waft down a bit. This event was staffed by volunteers, who gave up three hours of their time to serve beer & cider in exchange for a free t-shirt and entry to the event. Tastes of beer & cider (4oz) cost between 1 and 7 tickets each, depending on the product cost, with a ticket worth $1. Most selections were 2-3 tickets, but there were plenty of 1 ticket and 4-7 ticket selections. They also offered some pints for 3 tickets, including Crispin Blackberry Pear. I would have loved to have the brewers and cider makers at this event, but alas it was focused more on quantity and supposedly international & rare finds, than connecting drinkers with makers. Lots of yummy food choices, although I was really craving a soft pretzel or pizza or something. BBQ, gyros, burgers, burritos, grilled cheese, hot dogs, etc. I ended up with a hot dog while my two drinking companions (hubby & friend) had Gyros. We later snacked on some kettle corn and even a weird buckwheat pancake with butter & sugar confection (Miri’s Poffers). 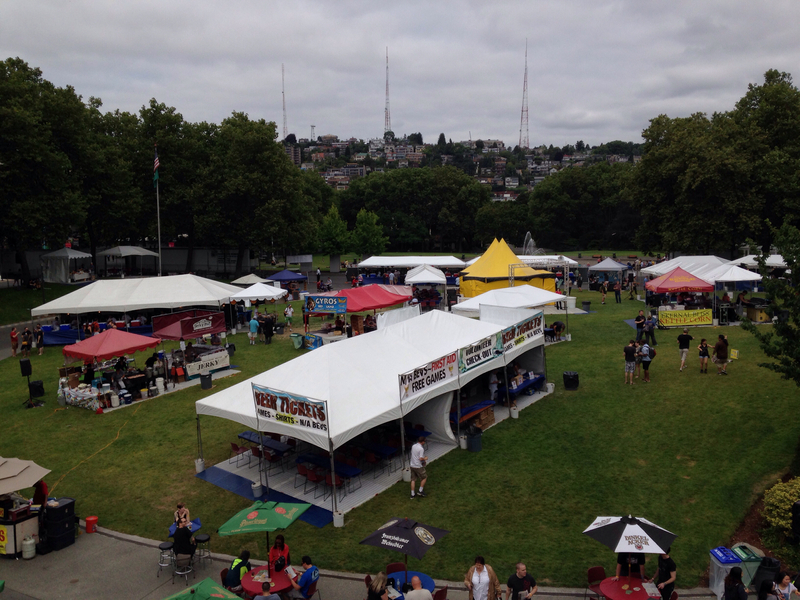 There were also a few non-food vendors, everything from engraved growlers to beer themed t-shirts to beef jerky. And now, on to the cider tasting notes…I ended up trying six ciders, four of which I hadn’t tried before. 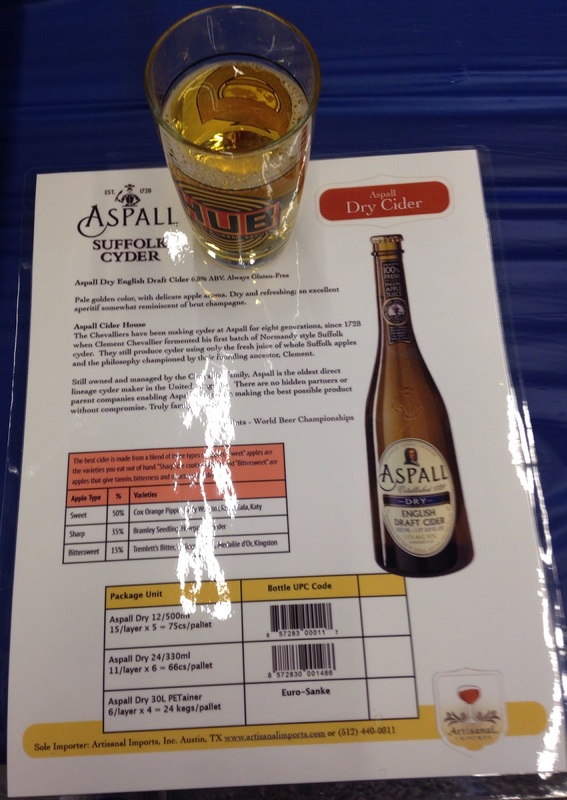 (1) Aspall Dry Cider (bottle, 6.8%, from England, 3 tickets). Dry English draft style cider. This was the surprising winner of the day! I would call it semi-dry. Very crisp & smooth with a traditional English cider taste. I found it to be pretty similar to Crispin Browns Lane. I plan to try another selection of theirs which is available near me (the only one), Aspall Blush cider. (2) Reverend Nat’s Hopland #5 / Envy (draft, 10.2%, from OR, 2 tickets). Intensely hopped cider with 11 hops varieties. I didn’t expect to like this as I don’t like hops, but thought I might as well try it. It has an unfiltered look to it, a bit orange and hazy. Very very hoppy, both smell & taste! It was also a bit boozy, which is to be expected at over 10%. I really couldn’t pick up anything in this besides hops. My companions tried it and couldn’t even taste that it was cider. This is definitely a beer drinker’s cider. Unfortunately after a couple sips it got dumped out, as it wasn’t even drinkable for my two beer loving companions. (3) Wyder’s Reposado Pear (draft, 6.9%, from VT, 1 ticket). Tequila barrel aged pear cider. I’ve had this at home a number of times and was curious if it would taste any different on tap than bottled. Surprisingly, not. If anything I didn’t like it as much on tap as it seemed to have less carbonation. For me this cider starts off with pear and finishes with tequila. Its smooth, and sweet to semi-sweet. I think its quite tasty. 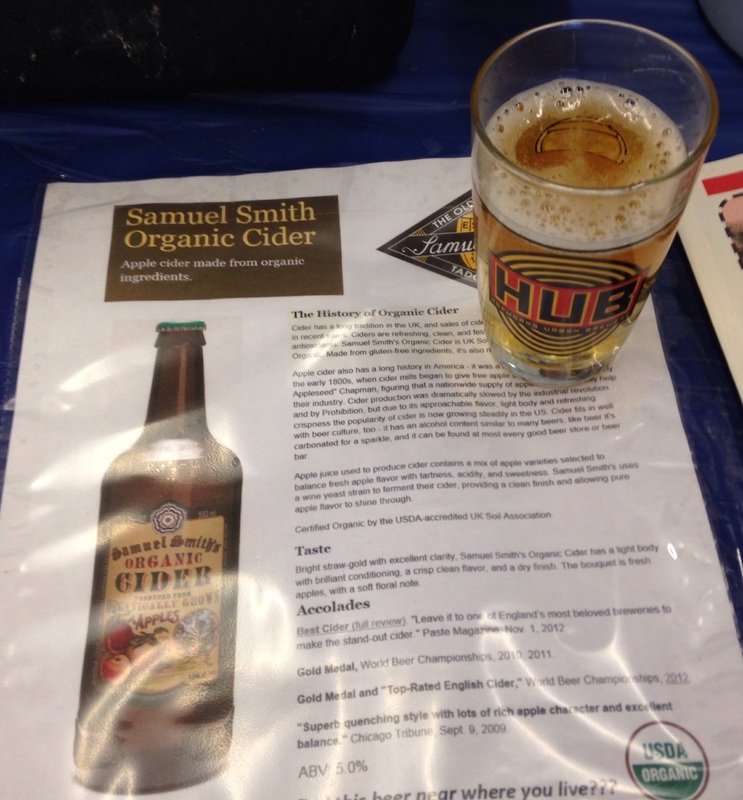 (4) Samuel Smith’s Organic Cider (bottle, 5%, from England, 2 tickets). This was pretty unremarkable for me. It had a definite sweet apple scent, but tasted semi-dry. It had a very quick finish to it and was overall quite plain. I think there is much better cider to be had for the cost. (5) Anthem “Raz & Boyz” (draft, unknown ABV but I’d guess 5-6%, from OR, 2 tickets). This was Wandering Angus’ mystery cider selection, from their Anthem line. I really don’t have any info on it, as it wasn’t in the event program and it appears to be brand new (no information even online). I wouldn’t be surprised if it is a new selection they released for the first time for the International Beerfest for Portland & Seattle, as they are from OR. All I could go off of was the name they scrawled on the small white board lol, so this likely isn’t even the cider’s real name. Very very tart! Semi-dry to dry. Brilliant red color. I only picked up raspberry, no boysenberry. It was more palatable once it opened up a bit by the end of the tasting glass. One of my companions thought it would be much better as a beer mixer than on its own, as it was just too dry & tart. I had fun watching people take their first sip after getting a glass of it, as most scrunched up their face! (6) Crispin Blackberry Pear (draft, 5%, from CA, 3 tickets for a full pint). Pear cider with blackberry. This was something else I’ve had at home but was curious if it was any different on tap (and I was out of new ciders to try). This is a sweet fairly straight forward blackberry & pear cider. Smooth, easy to drink, and slightly tart. This appeared to be a very popular selection, and I saw more folks with this in their pint glass than beer! It was actually a good deal too for $3 a pint as this cider runs about $9 for a four pack of 12oz bottles. Plus it really hit the spot to finish out the day. Overall, I highly recommend this Seattle-area tasting event. It’ll be a crowd pleaser for beer & cider lovers alike. It was unfortunately a bit spendy though: $95 for advance purchase admission for three with 60 tickets, $15 for parking, and food & souvenirs. Still a great way to spend the day though. We ended up getting one pack of 40 tickets for one person and two packs of 10 tickets each for two people, which worked out well to share. Although you can buy extra tickets, the “Big Deal” as they called it (advance purchase only) essentially gave you 10 free tickets, and having the tickets in advance encouraged us to go big and try some of the more expensive stuff (vs. having to shell out extra money for single tickets). My best advice is to arrive Friday afternoon when they open at noon, as around 4pm the crowds really picked up. Other advantages of arriving Friday are that you have in & out privileges (just need your wristband & tasting glass), and they may run out of some selections. Looking forward to next year!